For the chicken- butterfly, or pound, chicken to an even ½-inch thickness. Season with salt and pepper. Heat oil in a 12-inch heavy skillet over medium-high heat. Add chicken and sauté until golden and cooked through, about 4 minutes on each side. Remove chicken and tent with foil. Drain excess fat from pan. For the sauce-add Roasted Garlic or Traditional Marinara Sauce, olives, capers, red pepper and anchovy paste (optional) to the pan. Stir and heat over medium low heat. When sauce is hot add the chicken back to the pan. 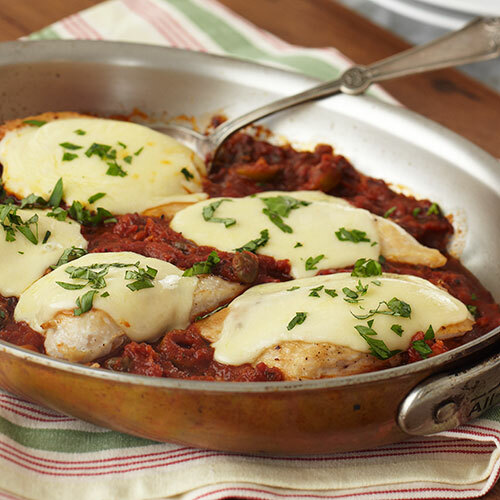 Top each chicken piece with a slice of cheese. Cover the pan and reduce heat to low. Heat until sauce bubbles and the cheese is melted. Sprinkle chopped herbs over dish and serve with your favorite pasta.